Saint Saviour in Chora (Kariye Museum) originally was a church belonging to a monastery built outside the walls of Constantine as "chora" means in the fields. Its name remained the same when later the monastery was included within the walls of Theodosius in the 5th century. There are no reliable traces of the history of the monastery, but from the 8th century its name was associated with many events. The Patriarch Germanus I (715-730) was deposed and confined to the monastery for his refusal to subscribe to the iconoclast policy of Emperor Leo III the Isaurian. In the reign of Constantine V (780-797), the most crucial phase of the iconoclast controversy, the monastery was deserted. Symeon, abbot of the monastery, was among the participants in the 7th Ecumenical Council of Nicaea (787), which restored the veneration of icons. After a period of decline, the monastery was restored in the 11th century by Maria Doukaina, a relative of Empress Catherine, wife of Isaac I Comnenus (1057-lO59). The ruined basilica was replaced by a new church of the Greek-cross plan with dome. In the early 14th century, Theodore Metochites, the pious and erudite Grand Logothete of the Treasury during the reign of Andronicus II Palaeologus (1282-1328), devoted a great part of his life and fortune to the restoration and enlargement of the church, adding the exonarthex and Paracclesion (funerary chapel). He is believed to have supervised the magnificent iconographic programme whose mosaics and frescoes (the frescoes can only be found in the Paracclesion) are masterpieces of the Palaeologan Revival. When Andronicus III (1328-1341) usurped the throne, he forced his grandfather to abdicate. Theodore Metochites was exiled for his loyalty to the old Emperor, but was allowed to return and retire to the Chora Monastery where he died on 13 March 1331, and is buried. The semicircular main apse to the east is flanked by two smaller apses, polygonal on the outside, laid out as chapels. A large dome rises above the square nave, two smaller domes above the end bays of the esonarthex, and one above the paracclesion. The miracle-working Icon of the Hodegetria (She Who Shows The Way), believed to have been painted by St. Luke the Evangelist, was kept at the Monastery of the Panaghia Hodegetria* (see below) and was carried along the walls of the City to encourage the defenders in times of siege. According to historian Ducas' account of the capture of Constantinople, the Xylokerkos Postern had been opened to enable the defenders to make a sortie on May 27. In order to protect this vulnerable part of the walls, the Icon of the Hodegetria was taken to Chora which was very near, but this did not prevent the besiegers to break into the city through the breach. The monastery was pillaged, the precious gems adorning the historic image were prised off and the icon was hacked into pieces. The church was transformed into a mosque as Kariye Camii in 1511, and the mosaics and frescoes were concealed under plaster and timber. Their gradual uncovering started in the 19th century. 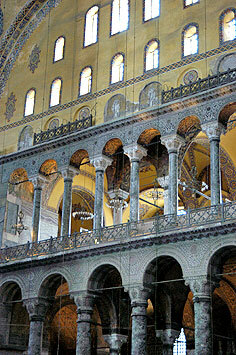 Between 1948 and 1959, works of restoration were undertaken by the Byzantine Institute of America. 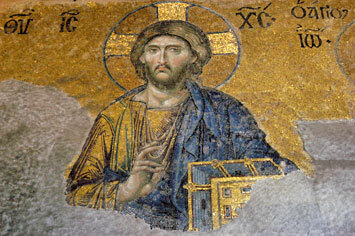 Except for some 11th century fragments of mosaics such as the Christ Pantocrator (The Almighty) above the gate between the esonarthex and exonarthex, the mosaics and frescoes date back to the 14th century and are among the most beautiful in the Byzantine World. 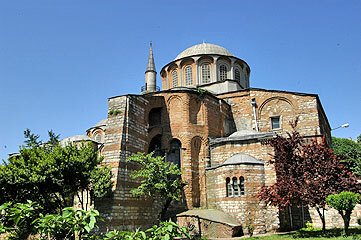 After Hagia Sophia, Chora gives the most interesting account of Byzantine Age in the city. 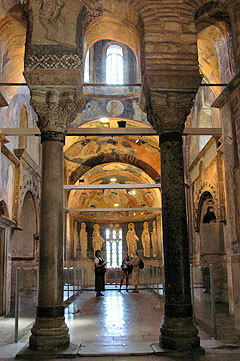 Saint Saviour in Chora was turned into a museum in 1948. 47- Christ healing Peter's Mother in law. * The Monastery of the Panaghia Hodegetria was founded in the 5th century by Empress Pulcheria (399-453), the daughter of Emperor Arcadius. Here was kept a picture of the Virgin Mary, believed to have been painted by St Luke, and which was sent to Pulcheria, who had taken a vow of chastity and was venerated as a saint. 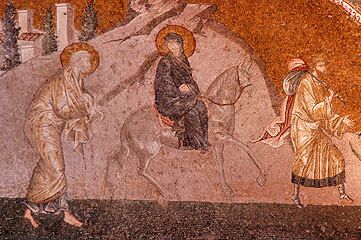 The explanation of the name of the icon, Panagia Hodegetria (She who shows the Way), is given through the legend which tells that nearby the church of the monastery was a source where the blinds and all who suffered eye disorders came to be healed, since the Holy Virgin would have appeared to two blind people and guided them here where she restored their vision. The sanctuary was rebuilt by Michael III (842-867) but almost nothing has remained of it (the few ruins are located near G�lhane Park). The icon is said to have been destroyed during the capture of Constantinople after it was placed into Saint Saviour in Chora. 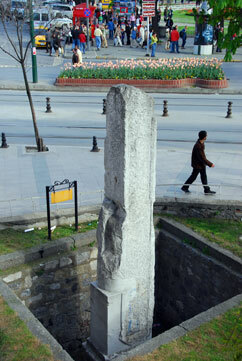 The Hippodrome (At Meydani) was the center of the city's public life during centuries. Its construction was started by Roman Emperor Septimius Severus in 203. 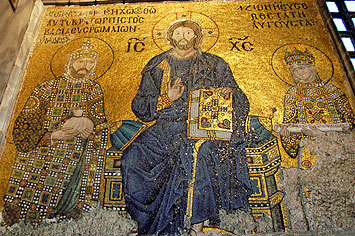 It was enlarged and richly embellished by Constantine the Great and after him, many emperors rivalled to adorn it. 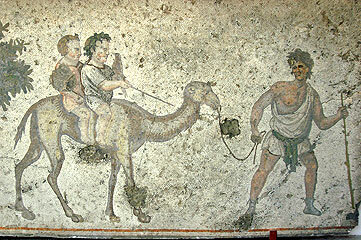 The hippodrome was approximately 400 m/ 438 yards in length and 120 m/ 131 yards in breadth. At the northern end were the "carceres", stalls for the horses and "bigae", two-horse chariots, and "quadrigae", four-horse chariots. Here were also the charioteers' (aurigae) barracks. On top of the central arch above the carceres stood four gilded bronze horse statues attributed by Pliny the Elder to Lysippus. Also above the carceres, close to the north-east corner, arose the "kathisma", a miniature palace with the Imperial loge in front. The kathisma (located approximately on the site of Emperor Wilhem II Fountain) was connected to the Great Palace. The race track was surrounded by high walls with many doorways, by stands and colonnaded galleries. Storehouses extended under the tiers of seats. Because of a level difference, the southern portion of the Hippodrome, terminated in a semicircle (the sphendone), was elevated on massive vaults. In the middle of the Hippodrome was the "spina", a central axis endowed with various monuments and statues. The Hippodrome is thought to have had a capacity of 100.000 spectators. 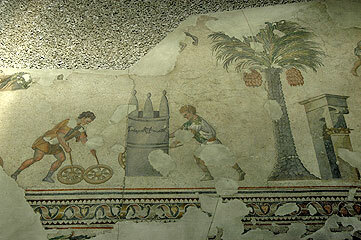 Here, athletic activities, various games and chariot races took place, giving rise to stakes among the people who were divided between two opponent political and religious factions who took their names from the two colors worn by the charioteers (originally there were four colours, but the Reds and Whites were aborbed by the two others): the Blues, who represented the upper classes and upheld the Orthodox doctrine, and the Greens who represented the lower classes and upheld the Monophysitism doctrine. The Blues seated in the stands to the left of the imperial box, and the Greens seated in the right stands. The emperors, according to their tendendies, used to protect one of the factions. On the other hand, the people would openly show their support or displeasure for the emperor. This kind of situation sometimes ended with political demonstrations or an uprising of one of the factions. However, in January 532, the two factions joined in the Nika revolt against Emperor Justinian and Empress Theodora (nika was the people's cry which meant "victory" during the games) when a part of the city was burnt down. Justinian was prepared to flee, but Theodora's courage and determination saved the situation. General Belisarius crushed the rebellion by killing 30,000-40,000 persons whom he surrounded in the Hippodrome. During the Fourth Crusade in 1204, the doge of Venice, Enrico Dandolo, ordered the Latins to sack the city. 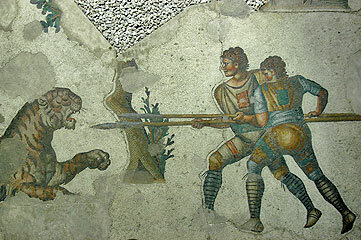 The Hippodrome was destroyed and plundered. He had the four gilded bronze horses, mentioned above, wrenched from their mountings and sent to Venice with many other riches: they were placed on top of the facade of the San Marco church. In 1797 Napoleon sent the statues as spoils of war to Paris where they were placed on top of the Arch of Carrousel, but upon his defeat the horses were taken back to Venice where they still remain. Following the Ottoman conquest, the Hippodrome, taking the Turkish name "At Meydani" (horse square) was used to train horses and for the equestrian game of cirit. The Hippodrome was the scene of Janissary rebellions but also of splendid festivities with parades and fireworks, like on the occasion of the marriage of Princess Hatice (a sister of S�leyman the Magnificent) to Grand Vizier Ibrahim Pasha (whose palace stands on the western side of the Hippodrome) in 1524, or on the occasion of the circumcision feast held for S�leyman's sons Mustafa, Mehmet, and Selim in 1530. - The Egyptian Obelisk of Thutmosis III (ca 1500 BC), a monolith of pink granite, comes from Karnak in Egypt. 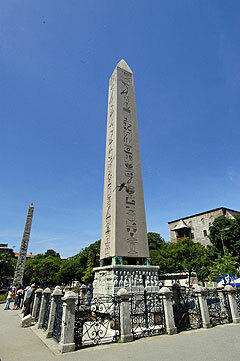 Probably transferred sometime in the 4th century at Constantine I or at one of his successor's behest, the obelisk remained many years in Alexandria waiting to be shipped to Constantinople. 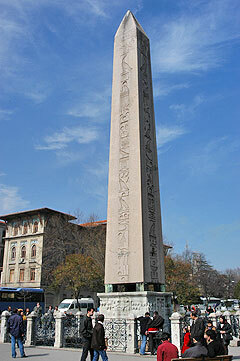 Once arrived, it had to wait again until it was raised in 390 by Theodosius, hence its name Obelisk of Theodosius. The hieroglyphs praise Tutmosis III, relating the pharaoh's victorious military campains in Mesopotamia and depicting him making offering to the god Amon-Re who also leads him by the hand (at the top). The obelisk, which rests on four bronze pedestals and a marble base, is 19 m/ 60 ft in height and 25 m/ 80 ft including the full base. Originally, it was much taller but a part was broken probably during its shipment to Constantinople. On the lower part of the base there are Greek and Latin inscriptions, low reliefs depicting the erection of the obelisk on the hippodrome, and chariot races around the spina where it was erected. 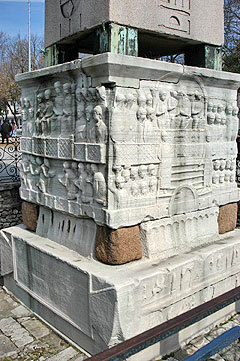 On the upper part of the base, the low reliefs depict the following scenes: on the east face (facing the Blue Mosque), Emperor Theodosius is shown with his two his sons, Arcadius and Honorius, distributing prizes to the winners of the races. 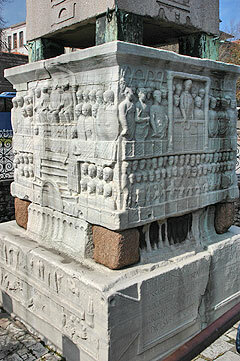 On the north face (facing the German Fountain), Emperor Arcadius is shown together with his wife, seated in the Kathisma. On the west face, Theodosius is show together with his wife and his sons, receiving the tribute paid by the defeated enemies of the Empire. 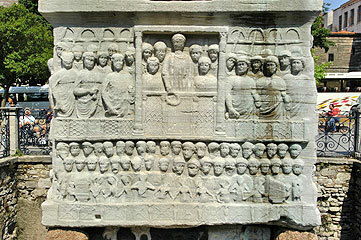 On the south face, the Emperor is shown, enthroned, watching chariot races with his family and surrounded by guards. - The Serpentine Column was originally erected in front of the Temple of Appolo in Delphi. The column, made of three entwined serpents supporting a huge golden bowl on their (now missing) heads, was a donation of the 31 Greek cities federacy who melted the spoils of war they obtained after they defeated the Persians at the battle of Plataea in 479 BC. 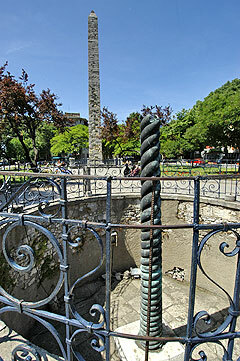 The column is thought to have been brought by Constantine I in the 4th century AD. The upper jaw of one of the serpents' head is on display at the Archaeological Museum. 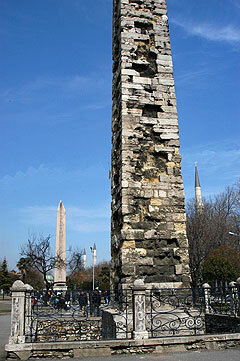 - The Column of Constantine Porphyrogenetus is made of stone blocks placed on a marble base. All what is known about this Byzantine monument is that it was restored and embellished in the 10th century by Constantine VII Porphyrogenetus. In 1204 during the Fourth Crusade, the bronze relief plaques that adorned the column were ripped off and melted down for re-use. The bottom of the pit approximately indicates the original level of the Hippodrome. - Emperor Wilhem II Fountain (Alman �esmesi, the German Fountain) was offered by Kaiser Wilhem II to sultan Abd�lhamit to mark his second visit to the Ottoman capital in 1898 and to commemorate the alliance of German and Ottoman powers. Brought from Germany, the fountain was inaugurated on the Hippodrome in January 1901 on the site of what was the Byzantine Emperor�s Lodge. The fountain, made of marble, has an octogonal shape and the interior of its dome is covered with mosaics. The fountain stands at the north side of the Hippodrome where the main entrance was situated. The Great Palace Mosaic Museum: After 324, when Emperor Constantine the Great made Byzantium the new capital of the Roman Empire under the name Constantinople, he had his new residence, the Palatium Magnum which also became the seat of the government, built on a hill, intending it to rival the Palatine in Rome. When the Nika Insurrection of January 532 reduced most of the palace complex to rubble, Emperor Justinian ordered a scheme of reconstruction and renovation. The palace district was enlarged from Haghia Sophia and the Hippodrome to the coast line and houses were built on the western slopes. The main buildings and imperial quarters were shifted to the middle terrace above the palace harbour. Over the centuries of Byzantine rule, the palatial complex and area underwent additions, conversions, and extensions, and finally suffered great devastation by the Latins during the Fourth Crusade in 1204. The old Great Palace declined when Alexius I Comnenus (1081-1118) moved the imperial court to the Palace of Blachernae, but it continued to be used for official receptions and audiences. Abandoned after the Byzantine reconquest (1261), building materials began to be removed from the Grand Palace to be re-used elsewhere. Reduced to a heap of stones, its substructures were used as a prison in the 14th and 15 th centuries. The palatial complex was organized as follows: the Mese (same orientation as the present Divan Yolu) was the ceremonial colonnaded way joining the Forum of Constantine to the Augusteum Square in front of Haghia Sophia. On the western side of this large square stood the "Million", a triumphal arch, from which all distances between Constantinople and the most distant provinces of the Empire were once measured. Further south were the Chalke Gate (a triumph arch covered with plates of bronze), the Senate building and the Magnaura Palace. To the south-west were the barracks, the Scholae, the Consistorium (the council chamber). Further west, adjoining the Hippodrome, were the magnificent Thermae of Zeuxippos, Haghio Stephanos Church, the Daphne Palace (the oldest palace of the Great Palace), the Kathisma Palace with the imperial loge opening onto the race track. Then the Golden Triclinium (banqueting hall) and Triconchae (triple shell) Palace. On a lower terrace to the south-west, the Palace of the Boukoleon built near the imperial harbour. To the north-east rose the Tzykanisterion (polo stadium). After the Ottoman conquest, the area was turned into a housing quarter and Sultan Ahmet I had the old Daphne and Kathisma Palaces replaced by the complex of the Blue Mosque. Between 1935-1954, British archaeologists partly excavated a portion of the Daphne Palace. They unearthed a palace hall (aula) with Corinthian columns and a large peristylar court which had been redecorated with mosaic pavement at the time of Justinian in the first half of the 6th century. 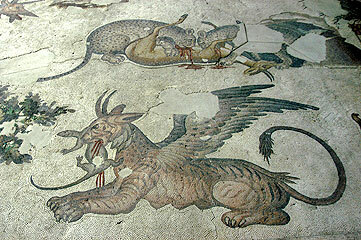 The mosaics depict the animal kingdom, scenes from everyday life, hunting and playing, pastoral and bucolic scenes, and legends. Additional archaeological works and the rescue, cleaning and remounting of the mosaics in their former place have been carried out between 1983-1997 by a joint Austrian-Turkish team. Further excavations have been directed since then in the area. 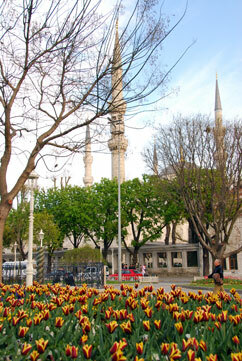 The museum is situated at the Arasta Bazaar, behind the Blue Mosque. Haghia Sophia (Ayasofya): the present basilica is the third to have been built on this site: the first one, which was erected by Emperor Constantine I's son Constantius II and whose dedication ceremony took place in 360, was connected to Haghia Irene with which it formed the Megale Ecclasia (the Great Church). It was partially burnt down in the uprising of 404. Theodosius II repaired it and the second church opened in 415. Following the Nika Revolt ("nika" was the people's cry which meant "vanquish" during the games) against Emperor Justinian in January 532, and together with Haghia Irene, the church was destroyed a second time by a fire. 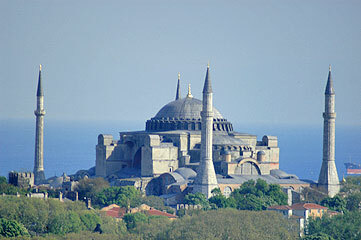 As soon as his position was once again consolidated, on 23 February 532 Justinian undertook the reconstruction of the basilica which he dedicated to the Divine Wisdom "Theia Sophia" (the name "Haghia Sophia" or in Turkish "Ayasofya", given by the Ottomans, has been retained up to our day). He commissioned two genius architects, Anthemius of Tralles (Aydin) and Isodorus of Miletus (both originating from Western Anatolia) and brought building materials from all over the Empire. Among these were columns from the Temple of Artemis at Ephesus and other ancient pagan temples. In the forecourt of the basilica, the Emperor had his equestrian statue erected at the top of a very high column. 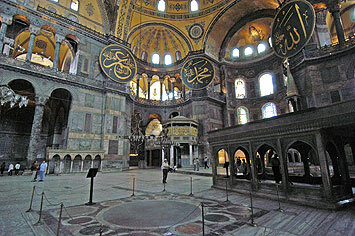 Once the construction completed, the basilica was inaugurated on 27 December 537, and Justinian, entering the Haghia Sophia, pronouced these historical words "Solomon, I have surpassed you!". 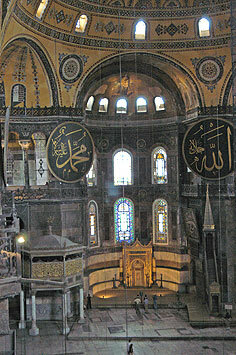 Thus Haghia Sophia became the main religious center of the entire Byzantine world. The innovative architecture and vast dimensions of Haghia Sophia, crowned with the huge central dome which represented the celestial realm in Orthodox belief, and the splendor of its decoration would awaken awe and admiration and make the church unrivalled during centuries. However the structure of Haghia Sophia was not entirely stable and the church suffered serious damage from earthquakes and fires. Following the earthquakes of 553 and 557, repairs were undertaken but a part of the central dome collapsed in 558. Isodorus of Miletus'nephew, Isodorus the Younger, was put in charge of the construction, building a new lighter dome and elevating it about 7m / 30ft. The church was reopened on 23 December 562. Two other earthquakes occured in 869 and 989 and repairs were once again undertaken during six years by an Armenian architect called Tiridat. 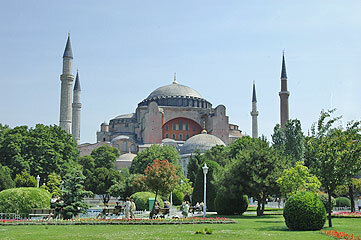 Haghia Sophia was the scene of many important events throughout Byzantine history. Here, emperors were crowned and victories celebrated. During the iconoclastic period all religious images were removed. In 1204, during the Fourth Crusade, the church was pillaged, the altar was shattered and animals were taken inside in order to be loaded with booty. The Holy Relics, of which "a Fragment of the True Cross", were sent to churches in the West. Five emperors were crowned in the basilica during the Latin occupation. 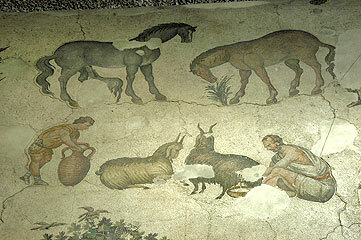 Beautiful mosaics were applied everywhere on the walls of the colossal edifice. Many of them have not been found even though they are known from several sources and have been sketched. All the figural mosaics date from 867 and after, following the conclusion of the Iconoclastic period in 843, and after 1261 when the Byzantines regained control of Constantinople. In 1344, another earthquake seriously damaged the church whose restoration was made only in 1354 because at that time, the Byzantine Empire was in a bad financial position. In the first half of the 15th century, western travellers reported that Haghia Sophia was in a deplorable state of disrepair. On 29 May 1453, when Mehmet the Conqueror entered the city, he went straight to Haghia Sophia but he found the church unmaintained. Following a thorough cleaning, the church was converted into a mosque where the young Sultan recited his first Friday prayers. 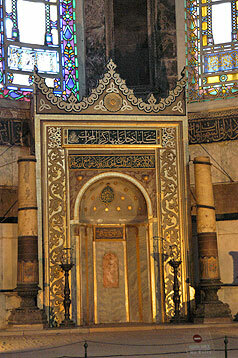 Under the Conqueror's reign, a wooden minaret and a mihrab (prayer niche) were added for the islamic cult. In 1572, Selim II commissioned Chief Imperial Architect Sinan with the great restoration of the building which was leaning to one side. The butresses placed in the 9th, 10th and 13th centuries were strenghtened or amended and three minarets (the one on the Imperial Gate side is fluted) were added to the brick minaret (dating from the reign of Mehmet the Conqueror or Bayezit II), while the old wooden minaret was removed. Also, a minber (pulpit) carved in marble, tiles in and around the apse (one of them is a depiction of the Holy Kaaba in Mecca), a muezzin's gallery and a loge for the sultan were added inside. These extensive works were completed under the reign of Murat III. After the construction by Sinan of Selim II's t�rbe, many members of the Ottoman dynasty (sultans until Ibrahim I as well as princes) were buried in the southwest side of Haghia Sophia. During the restoration works led between 1847-1849 at Sultan Abd�lmecit's behest, the mosaics, which had been concealed under layers of whitewash or plaster during the Islamic period, were uncovered by Swiss architect Gaspare Fossati and his brother Giuseppe. Before they were covered up again, Fossati made sketches of them, but in 1852, he merely published a color album consisting of drawings showing the interior, exterior and surroundings of Haghia Sophia. Prussian architect Salzenberg made color sketches of the mosaics published in an album in 1854. The former Imperial Loge was demolished and replaced by a new one rich in ornament. The original Imperial Pavillion connected to it was also remodelled by Fossati. Eight round wooden plaques, 7.5 meters in diameter and replacing the former square ones, were hung from the piers at the gallery level. Kazasker Izzet Efendi decorated them with calligraphic writings mentioning the names of Allah, the Prophet Mohammed, his two grand-sons Hassan and Husseyn, and of the first four Caliphs Abou Bekr, Omar, Osman and Ali. The names will be read clockwise starting from the right of the apse: Allah, Mohammed, Abou Bekr, Osman, Husseyn, Hassan, Ali and Omar. Kazasker Izzet Efendi also restored the inscription in the center of the dome which most probably conceals a mosaic of Christ Pantocrator: originally, there was a 6th century large cross replaced about 842 by a mosaic of Christ. 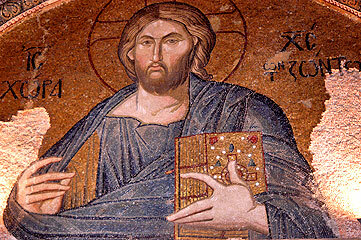 Damaged during the earthquake in 989, it fell off in 1348 and a huge mosaic of Christ Pantocrator was applied instead in 1355. After the earthquake of 1894, when large peaces of plaster and mosaics fell from the semi-domes and vaults, Haghia Sophia remained close for many years. A team of foreign experts worked on new restoration projects which were interrupted by the Balkan War and the First World War. 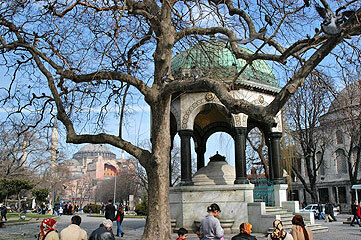 Restoration works could only be resumed after the War of Independence and the foundation of the Turkish Republic. 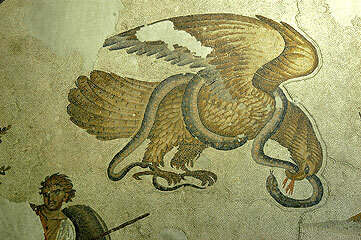 In 1932 an American, Thomas Whittemore, was granted permission to uncover the mosaics which were discernible under the withewash applied by Fossati, and he started his work from the Imperial Gate. 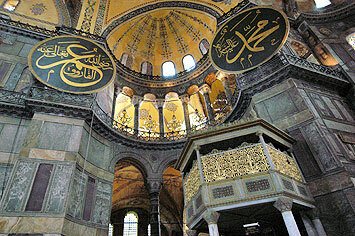 At the end of 1934, at Atat�rk's behest, Haghia Sophia ceased to be a mosque. On 1 February 1935, it was inaugurated as a museum. Restoration and excation works have been carried out since then bringing to light new findings. 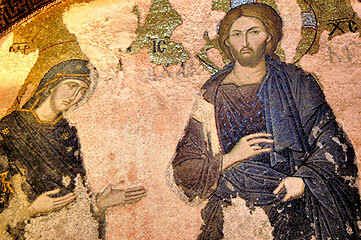 During the past years the American Byzantine Institute took care of the restoration of the mosaics. Conservation and restoration project of the surface decoration of the dome carried on by the Ministry of Culture, Directorate General of Monuments and Museums, Central Laboratory for Restoration and Conservation, is sponsored by World Monuments Fund since 2000. The edifice is a domed basilica oriented on the northwest-southeast axis. 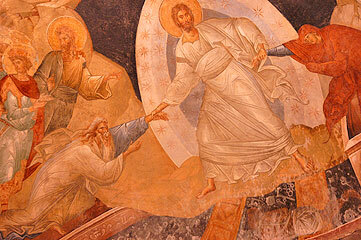 It is 93m/ 305 ft long from the exonarthex to the apse. The nave is 75 m/ 246ft long and 70 m/ 230 ft wide including the side aisles. 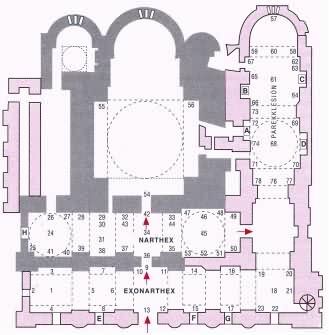 The church is composed of an exonarthex (the outer narthex) with five doors leading into the narthex divided into nine sections by arches. The walls of the narthex are lined with polychrome marble panels and bordered by a frieze and its vaults are adorned with mosaics with geometric motifs and crosses on a gold background. At the north end of the narthex, a ramp leads to the upper level. 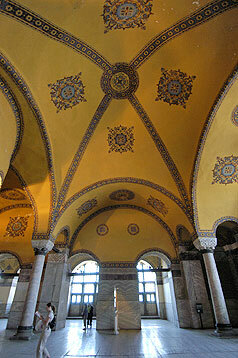 At the south end is the "Horologion, a vestibule with bronze doors (838) through which the emperors entered Haghia Sophia. The mosaic of the Virgin, Constantine and Justinian can be seen above the inner door: this 10th century mosaic depicts the Virgin Mary holding the Infant Jesus in her lap. In the two medallions are written "Meter" and "Theou" (Mother of God). 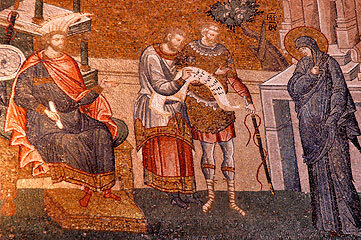 On Mary's left is Emperor Constantine, the founder of Christian Constantinople, offering a model of the city. At his side is written "Constantine the Great among the Saints". 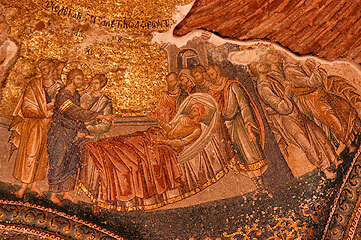 On Mary's right is Emperor Justinian offering the Haghia Sophia model. The writing at his side says "Emperor Justinian Whose Memory is Renowned". Each section of the narthex has a door giving onto the central space of the church. 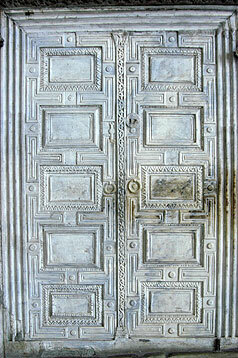 All these bronze plated doors date back to the period of Justinian. The tall door in the centre, or Imperial Gate, was reserved for the emperor who had to prostrate himself before crossing the threshold. It is crowned by the mosaic of the Christ Pantocrator: this 10th century mosaic depicts Emperor Leon VI (886-912) prostrating before Christ Pantocrator (the Almighty) seated upon a jeweled throne. The inscription on the book he holds says "Peace be with you, I am the Light of the World". In the medallions are the Virgin Mary and an archangel, probably Gabriel. The rectangular nave, paved with marble, is separated from the side aisles by four huge piers and columns all of them richly decorated. The dome has forty windows set in it and in the center there is a calligraphic inscription executed by Izzet Efendi in 1849. It rises 55 m/ 180 ft above the pavement and its diameter varies between 31.20 m/ 102 ft and 32.80 m/ 107.60 ft. The dome was damaged during earthquakes and fires and restored a few times. The dome's thrust is received by the pendentives (adorned with frescoes depicting Seraphim), columns, arches, vaults and the two large semi-domes, themselves divided into three semi-domes. The semi-dome of the apse is decorated with the mosaic of the Virgin and the Child , probably the oldest in the church: it depicts the Virgin Mary (Theotokos) with Jesus in her lap. Gold which is largely used to contrast with the sobriety of the Virgin's garment enhances the beauty of the composition. In order to examine this beautiful mosaic more closely, one should look through the easternmost opening of the upper gallery. Two mosaics depicting angels can be seen on the arch above the bema (chancel). The one on the right, mostly intact, is Archangel Gabriel. 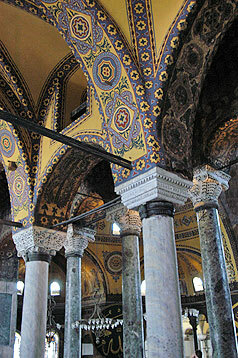 The upper level of Haghia Sophia includes the "gynekaion", a space over the narthex reserved for the women with a loggia for the emperor, and galleries. A marble separation wall carved like wooden doors delimits the entrance to the southwest gallery which houses beautiful mosaics: a 12th or 13th century mosaic depicts the Deesis where Christ Pantocrator (the Almighty) is flanked by the Virgin Mary and St John the Baptist (Prodromus) begging for His help to mankind on the Day of Judgment. On the eastern wall on the right of the gallery, a 11th century mosaic depicts Christ sitted on a bench-like throne, flanked by Empress Zoe holding a scroll documenting the donation of money to the church, and her third husband Constantine IX Monomachus (1042-1055) holding the purse with the donation. To the right of this mosaic is a panel which depicts the Virgin holding the Infant Jesus and flanked by John II Comnenus (1118-1143) and his wife of Hungarian origin, Irene, and their son Alexius. Situated outside the Horologion door is the Baptistry. When it was converted into a mausoleum, the large baptismal font was placed in the small courtyard connecting the baptistry to the church. The skeuophylakion, a small circular building outside the northeasten corner may possibly date back to the time of the first Haghia Sophia. It housed the Church treasure. that town was conquered in 1526. In the inner Narthex above the main entrance (Imperial Gate): Emperor Leon VI (886-912) is prostrating before Christ Pantocrator (the Almighty) seated upon a jeweled throne. The inscription on the book he holds says "Peace be with you, I am the Light of the World". In the medallions are the Virgin Mary and an archangel, probably Gabriel (10C mosaic). 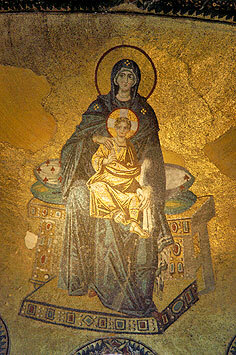 In the semi-dome of the Apse: the Virgin Mary (Theotokos) with Jesus in her lap. Gold which is largely used to contrast with the sobriety of the Virgin's garment enhances the beauty of the composition. In order to examine this beautiful mosaic more closely, one should look through the easternmost opening of the upper gallery. 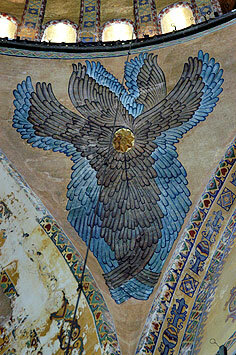 On the right side of the large, broad cradle vault in front of the apse, Archangel Gabriel is standing with the tip of his wings drooping and he is wearing a ceremonial garment peculiar to prominent official of the Byzantine palace. 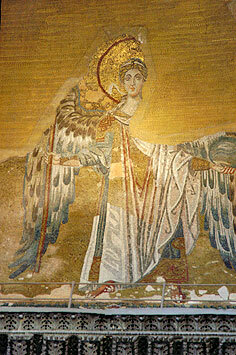 The mosaic of the other side represented Archangel Michael. At the end of the inner narthex, just before the exit, is the beautiful 10C mosaic depicting the Virgin Mary holding the Infant Jesus in her lap. In the two medallions are written "Meter" and "Theou" (Mother of God). 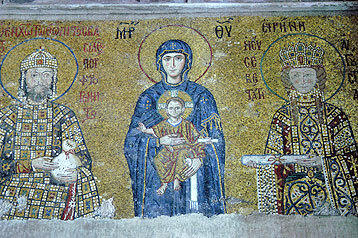 On Mary's left is Emperor Constantine, the founder of Christian Constantinople, offering a model of the city. At his side is written "Constantine the Great among the Saints". 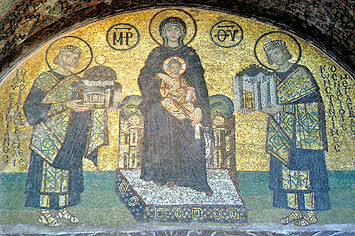 On Mary's right is Emperor Justinian offering the Haghia Sophia model. The writing at his side says "Emperor Justinian Whose Memory is Renowned". In the center of each of a row of niches on the lowest part of the wall are the pictures of the church notables who were canonized. On the wall of the south side is a 12 or 13C mosaic depicting the Deesis: Christ Pantocrator (the Almighty) is flanked by the Virgin Mary and St John the Baptist (Prodromus) begging for His help to mankind on the Day of Judgment. 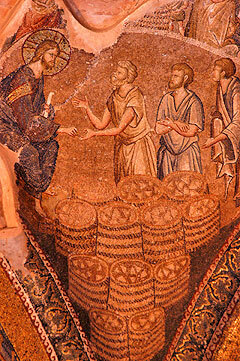 On the eastern wall on the right of the gallery a 11C mosaic depicts Christ sitted on a bench-like throne, flanked by Empress Zoe holding a scroll documenting the donation of money to the church, and her third husband Constantine IX Monomachus (1042-1055) holding the purse with the donation. To the right of the mosaic of Zoe is a panel which depicts the Virgin holding the Infant Jesus and flanked by John II Comnenus (1118-1143) and his wife of Hungarian origin, Irene, and their son Alexius. Inside the first pier supporting the dome arch in the north gallery, the mosaic of Emperor Alexander is located in a remote and dark place. The latter reigned jointly with his brother Leo VI (886-912-913) but he was an insignificant person, prefering enjoying himself in the palace rather than taking care of the state. On the surface of the four pendentives there are four angels (cherubim or seraphim) made essentially of mosaics, but the two on the west were completed as frescoes as a result of destruction which occured during the Byzantine period. These were never concealed with withewash. During Fossati's restoration, their faces were covered with ovals containing a single gilded star.